Where does the name ‘Jacob’ sheep come from? 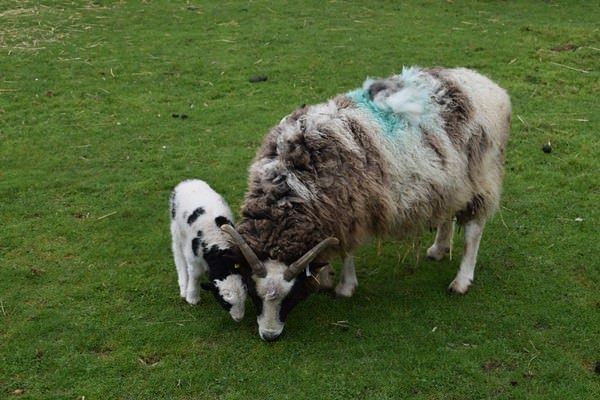 You can easily spot the Jacob sheep at Sacrewell as they have piebald fleeces with brown and white patches and even the ewes have at least one pair of magnificent, curly horns. They are a very old breed of sheep and the story is that their name comes from the Bible (Genesis 30). Here it is mentioned that Jacob has a flock of spotted sheep which he takes with him when he moves from Mesopotamia (which includes modern day Syria) to Egypt. It is thought that the sheep would then have been brought from northern Africa to Spain and into the rest of Europe. It does seem likely that these hardy sheep originated in the Middle East and were brought into Europe via Spain. There are written records of both ‘Jacob sheep’ and ‘Spanish sheep’ in the UK in the nineteenth century. Jacob sheep are prized for their fleeces which produce wool that naturally varies in colour and so can be used by knitters and weavers to create items that are completely unique.